Presence of numerous small and medium players makes the global processed food and beverage preservatives market fragmented. In such a cutthroat environment, companies that have come to hold a prominent position are Koninklijke DSM N.V., Celanese Corporation, Shanghai Ruidian Trading Development Co., E. I. du Pont de Nemours and Company, Kerry Group Plc, and Galactic SA. One of the reasons why the firms have come to hold a prominent position in the global processed food and beverage preservatives market are their high quality products. These has helped them to expand their global outreach. Apart from that, the companies’ thrust on strategic mergers and acquisitions has also helped them to expand in the global processed food and beverage preservatives market. 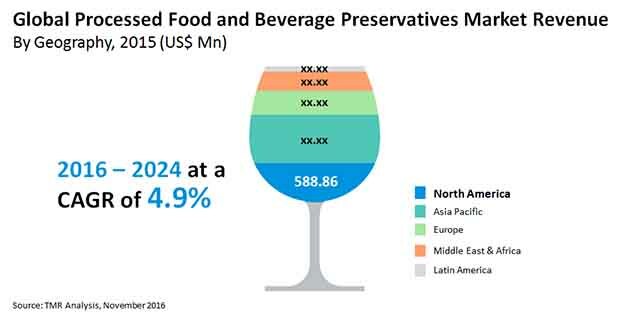 A report on the global processed food and beverage preservatives market finds that it would rise at a steady 4.9% CAGR over the course of the forecast period starting from 2016 and ending in 2024. Surging at this rate, the market which was valued at US$1.7 bn in 2015, will likely touch US$2.5 bn by 2024-end. The different types of products available in the global processed food and beverage preservatives market are natural and synthetic. Between the two, the synthetic products account for most of the share in the market. By the end of 2024, the segment is predicted to hold a share of US$947.2 mn. From a geographical standpoint, the North America processed food and beverage preservatives market is predicted to take the lead with respect to revenue generation. The relatively higher spending capacity of people in the region is mainly responsible for the growth in the market. Going forward too, the market in the region is predicted to retain its dominance by clocking a 4.8% CAGR during the forecast period. At the forefront of driving the global processed food and beverages preservatives market is the changing eating habits of people worldwide. With rising globalization and lowering of regulatory hurdles to trade in different nations, multinational food and beverage companies have penetrated to every corner of the planet. This has not just changed the eating habits of people, but also given rise to local players in the processed food and beverages market, which in turn has stoked the processed food and beverages preservatives market.